I posted recently in advance of this event with Central Saint Martins, UAL. It’s now happened and I just wanted to share the experience. It was a real honour to take part in such a high profile event whilst raising issues close to my heart. I was actually quite surprised by how much I enjoyed it, especially engaging with people and very encouraged by how positive their reactions were. I believe that everyone is artistic and that creative subjects must be made compulsory at secondary school; we would be a richer, more contented and balanced society that would find better solutions to the big issues. The global concerns of our time (resolving conflict, climate change, immigration and a tough economic environment, etc) require creative solutions BUT our education system is producing a generation who think within the ‘academic’ box. Most people believe that they are not creative /can’t draw and are not encouraged to do so. 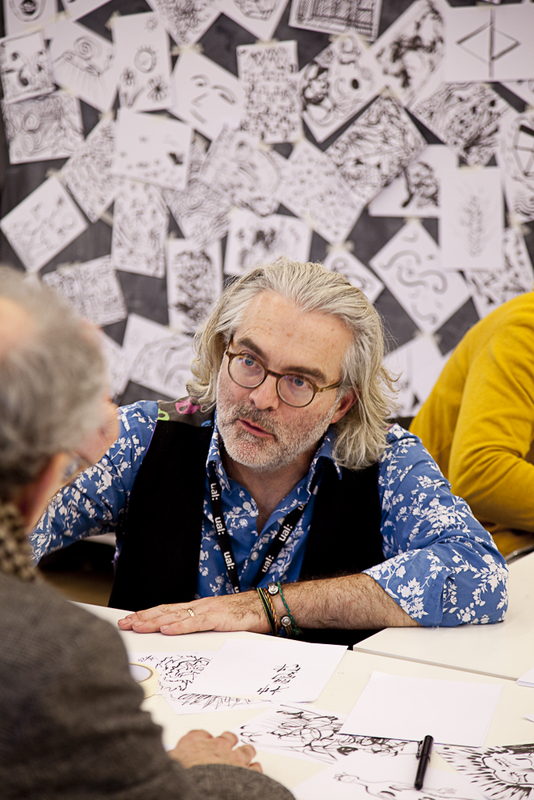 My workshop was designed to inspire and ignite creativity in all and was a call for change. 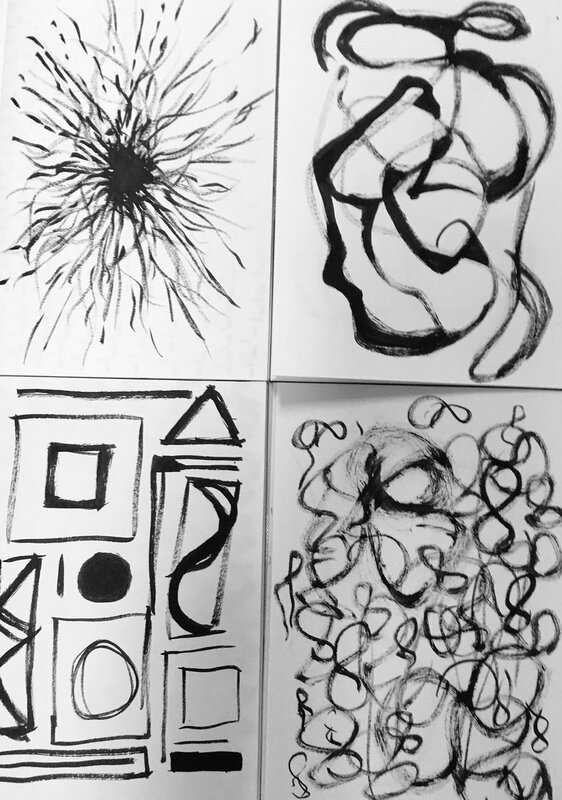 ‘Students’ were asked to produce a ‘doodle’ – without ‘thinking’. They were encouraged not to be considered in their approach but to ‘play’. However, for me doodles are drawings direct from the unconscious and reflect the creative impulse. Lack of expectation/pressure to make an ‘amazing’ piece of art (everyone can doodle) encouraged participation. 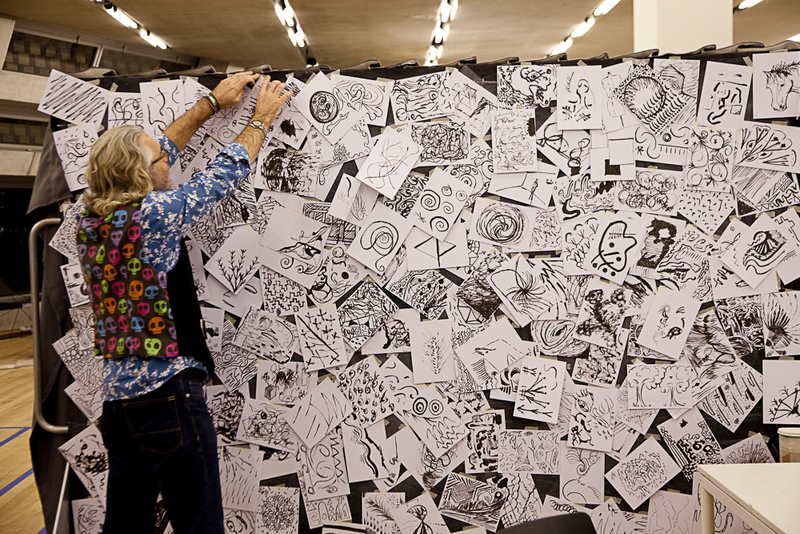 By combining all doodles into a large abstract assemblage on an expansive wall; each ‘doodle’ became a small but vital contribution to this collective installation. This project might not have felt like a big deal to those of us in the art world but for many other people who feel marginalised, even afraid of art, the opportunity for them to contribute to an installation at the ‘Tate’ presented a powerful message. 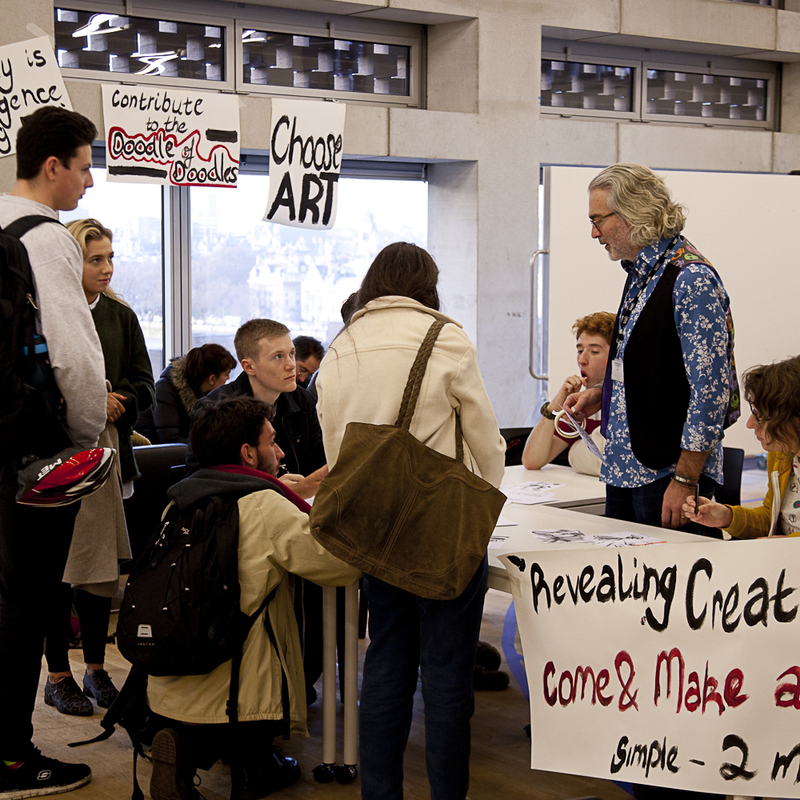 I was surprised how rewarding and enjoyable it was for me to take part in this and was bowled over by the excitement and enthusiasm of the public – not one person declined contributing; even those who initially said that they couldn’t draw or even doodle… Also, everyone seemed supportive of the premise that creativity should be encouraged in all. A huge variety of people took part from a 2 year old, through art students from Goldsmiths and Medical Students – What fun we had! This entry was posted in art exhibition, drawing, gary scott blog, sketching and tagged art exhibition, gary scott, gary scott blog, gary scott sculptor, gary scott sculpture, sculpture exhibition. Bookmark the permalink. This sounds like an amazing thing to do. I’m envious!